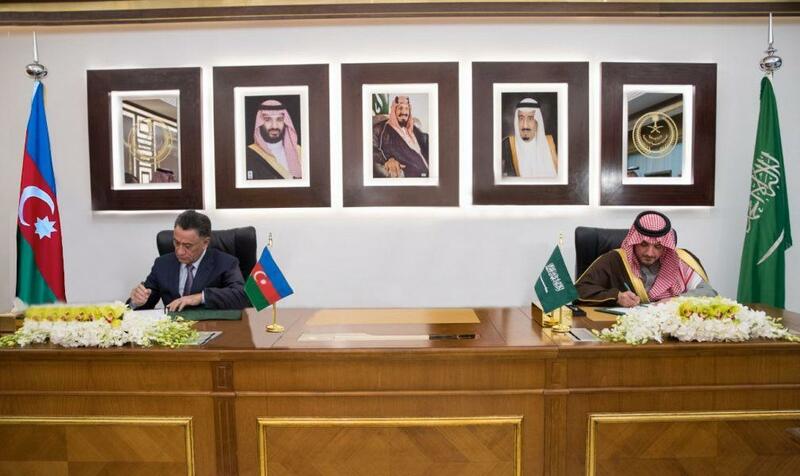 Saudi Minister of Interior, Prince Abdulaziz bin Saud bin Nayef bin Abdulaziz and Azerbaijan's Interior Minister Ramil Usubov signed a protocol for cooperation between the Kingdom of Saudi Arabia and Azerbaijan in the field of combating crime. The signing ceremony was held following a series of official talks between the two sides in Riyadh on Feb.20. The sides also discussed ways of enhancing the prospects of joint cooperation between the security services in both countries as well as the developments in the regional and international arenas. The meeting was attended by Saudi Arabia's State Security Chief Abdulaziz al-Huwairini, Interior Ministry Undersecretary Dr. Nasser al-Daoud, Assistant Interior Minister for Operations and Public Security First Lieutenant Saeed al-Qahtani, Undersecretary of the Ministry of Interior for Security Affairs Maj. Gen. Mohammed al-Muhanna in addition to a number of officials from both countries.